This handy tool is designed specifically for weaving fabric strips. 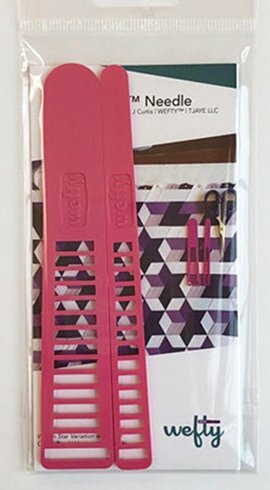 The WEFTY allows you to build your own unique fabrics, produce tighter weave designs, and reduce wear and tear on your hands. The eye at the end secures the fabric strip and keeps it flat as you weave. You may hold the WEFTY by the sides or push it from the top. Two sizes 5-1/2" long included.